Fluoride is a mineral that is known to help prevent cavities. When it is applied topically to the surface of the teeth, fluoride helps to rebuild weakened enamel and reverse early signs of tooth decay. It can also help reduce tooth sensitivity. Children and adults can both benefit from fluoride treatment. In Windsor, ON, Dr. Stephen Lipman offers professional-grade fluoride applications for patients with a moderate to high risk of developing tooth decay. With effective, targeted treatment, Dr. Lipman can help you and your family maintain healthy smiles for years to come. To find out more about fluoride treatment at our friendly, caring dental practice, please contact us today. It is especially important for infants and children between six months and 16 years of age to be exposed to fluoride. Tooth decay (also known as dental caries) occurs when the acid in our mouths attacks the surface of our teeth. This acid is produced by the bacteria that live in plaque, a sticky substance that accumulates on the teeth. When foods and drinks containing sugar or starch enters the mouth, the bacteria converts them into acid, and plaque holds the acid in contact with the tooth enamel. Some of the calcium and phosphate minerals that make up the enamel begin to dissolve into the plaque in a process called demineralization. Saliva contains minerals that neutralize the acid and help the enamel repair itself (remineralization). The fluoride contained in fluoridated water, toothpastes, and other sources further aids the minerals' return to the enamel’s surface after the acid has been neutralized. This is a natural cycle that takes place inside our mouths every day. Tooth decay occurs when the minerals lost from the tooth enamel overcomes the effect of remineralization. 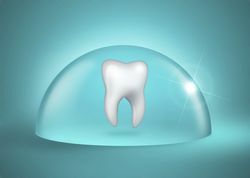 The bacteria can then penetrate the inner structure of the tooth, forming a cavity. Fluoride interferes with the process of tooth decay in several different ways. When children ingest fluoride during the time that their tooth enamel is developing, it alters the structure of the enamel and makes it more resistant to the effects of acid. It is especially important for infants and children between six months and 16 years of age to be exposed to fluoride. Keeping low levels of fluoride in the mouth through the use of fluoridated water and other products after the teeth have developed encourages remineralization and improves the quality of the enamel crystals. Fluoride also reduces the ability of the bacteria in the plaque to produce acid. The fluoride preparation that Dr. Lipman uses in his office is much stronger than that contained in over-the-counter toothpastes and mouth rinses. It can be applied in the form of a gel, foam, or rinse and treatment takes just a few minutes. After the application, you may be advised to avoid eating or drinking for at least a half hour so that your teeth can absorb the fluoride and allow it to repair the enamel. Depending on the individual patient, Dr. Lipman may recommend a fluoride treatment one to three times a year. He might also recommend additional over-the-counter or prescription fluoride rinses or gels, as well as antibacterial rinses. Timely fluoride treatments for appropriate candidates can be an important key to keeping teeth healthy. For over 25 years, Dr. Lipman has been providing outstanding dental services, including professional fluoride treatments, to patients of all ages. To learn whether this treatment can benefit you, please contact our office and schedule an appointment.